Ken is a 4th generation native Floridian and is currently President/Owner of Estate Management LLC, a full service property management company. Ken has over 27 years of experience in property management mainly focusing on Captiva Island. A veteran of the United States Coast Guard, he began his career on Captiva Island in 1988 at South Seas Plantation Resort and Yacht Harbour. He later started Estate Management in 1995 servicing the islands as a full serviced residential property management company. In 2007/2008, he was hired as Vice President of Operations at Ernie Els Design, an international golf course design and real-estate development group. Integrity and excellence in both development and community service are core principles that guide Ken and his team. EM LLC has a long-term track record of providing extraordinary service in managing properties for their clients. Ken has personally expedited 65 Hurricane Charley claims for his clients successfully and won 2 appeals through mediation to obtain maximum insurance payments for claims filed. 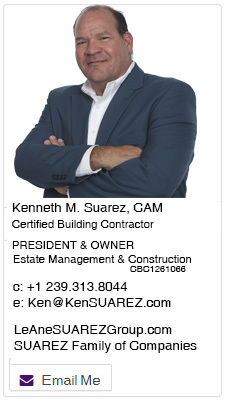 His professional certification includes: Certified Building Contractor, Community Association Manager (CAM), Realtor®, Certified Rooms Division Executive (CRDE) from The American Hotel & Motel Association of America. 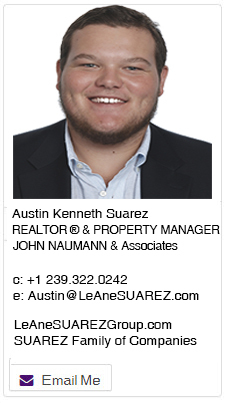 Austin Suarez is the first “fifth-generation” native Floridian and is currently working as a property manager in Estate Management LLC, a full service property management company. Boasting a sound academic record, Austin attended Sanibel School and Bishop Verot Catholic High School. He continued his education with academic and athletic scholarships at Florida Southern College, playing for the Men’s NCAA Division II Lacrosse Team. Austin recently graduated with a Bachelor’s of Science degree in Political Science and was selected to The National Society of Leadership and Success. Austin joins Estate Management LLC with a strong background in property management as his father, Ken, has been in the business of Property and management for the past 25 years. By growing up in a real estate household, Austin has a deep appreciation for the island lifestyle and the value of providing first-class services.